Consistency and workability are often confused with one another. Workability means the ease with which concrete can be moved and placed in forms without segregation . Consistency, on the other hand, is degree of wetness of concrete. Means how much wet the concrete is. Lets see the difference between consistency and workability in detail. It is often said that increasing water increases workability of the concrete. However, this is not always true. Increasing water or degree of wetness doesn’t always increases the workability. If water is increased then there are greater chances of segregation. If concrete is segregated then it means coarse aggregates are separated from fines. In this case as coarse aggregates settles down then it is difficult to move and place the concrete. In other words, workability of concrete decreases due to segregation. In addition to water, workability of fresh concrete also depends on size and amount of coarse and fine aggregates. Consistency cannot measure workability but it can give indication of workability of concrete. Consistency of concrete is measured with the help of slump test. 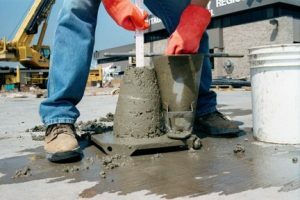 In slump test, fresh concrete is filled in a cone in three equal-volume layers and each layer is consolidated with rodding it 25 times with a tamping rod. The cone is then lifted up straight and the sag of the concrete is measured to nearest 1/4 inch from top of slump cone. Detailed procedure of slump test can be found in ASTM C143/143M titled ‘Standard Test Method for Slump of Hydraulic Cement Concrete’. A lower slump like 2-4 in is an indication to less workable mix. However exact answer to how workable is the mix depends on where the concrete is to be placed. For small structures or where steel reinforcement is too congested, this indication is true. Concrete will be difficult to place there. However, for mass concrete, like in foundations or where the finishes are done with power finishing machines, this indication can be not perfectly true. We may require 4 in slump for foundation concrete to control segregation and it can go just perfect.